Garlic is touted to be beneficial, particularly raw garlic if a small amount about a tablespoon is ingested daily. A problem is the garlic is very hot and difficult to ingest raw. Also garlic must be crushed and allowed to rest for at least 15 minutes prior to using to get minimum benefit. Mine is prepared using kefir which I ingest daily. 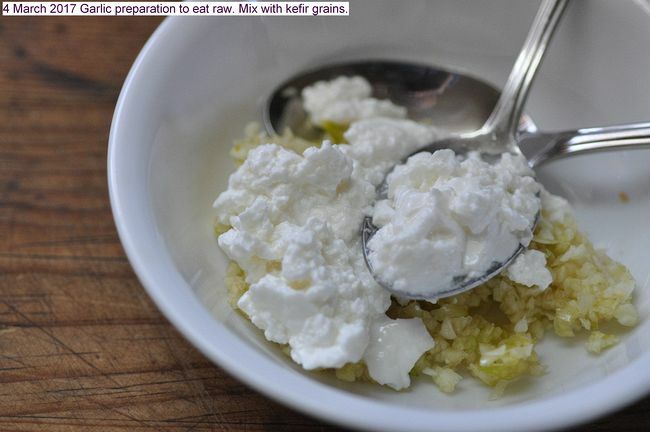 The kefir is similar to cottage cheese and tends to reduce the garlic sting, not completely but it is made tolerable. The garlic is prepared by crushing in a tortilla press to remove the skin. This is by far the best method of removing the garlic skin. Then the cloves are chopped and crushed finely in an OXO chopper. The fine crushed garlic is allowed to rest at least 15 minutes to get maximum benefit. A tablespoon is then mixed with the kefir and ingested daily. Excess chopped garlic is stored in a tight plastic container and stored in the refrigerator. A large garlic bulb stores for about four days. Pictures depict the process. This entry was posted in Uncategorized and tagged 4 March 2017 Garlic Preparation to eat raw, Garlic Preparation to eat raw, Removing sting from raw garlic.. Bookmark the permalink.